Halloumi is definitely one of my favourite things to eat. It’s the most wonderfully meaty cheese that brings a guilty edge to any vitamin-packed salad. On Wednesday afternoon, I took Niall for lunch in BiBi’s, one of our favourite spots in our new neighbourhood. I was a little nervous and my tummy was being a bit belly-floppy. For, you see, after lunch I was planning to somehow get Niall to the Iveagh Gardens where, in the tradition of Leap Year, I was going to propose to him. Boy, was I grateful to see an energy-boosting couscous with pan-fried halloumi cheese on the menu in BiBi’s that day. The beautifully seasoned bowl of tasty goodness was brought to life by the addition of harissa to the couscous and a sumac-flavoured yoghurt keeping the heat of the spicy couscous under control. Niall enjoyed his smoked salmon tart too, blissfully unaware of what was about to happen. Today I recreated my halloumi salad for an engagement lunch. I think we’ll be having Engagement everything for a while now as I doubt the novelty will wear off too easily. Engagement naps, engagement chocolate, engagement beers…you get the idea. Deseed and roughly chop your red peppers and green chilli. Put in a roasting dish, sprinkle with a pinch of salt and pepper and drizzle with olive oil. Roast in the oven for 20 minutes until the peppers are tender. Meanwhile, make your couscous. Put a dry frying pan over a medium to high heat. Put in the couscous and toast it until the little couscous (cousci??) have browned. Now add the stock into the pan and let it sizzle and bubble, stirring quickly with a spoon the whole time until the couscous has completely absorbed the stock. Take it off the heat and transfer to a large mixing bowl. Set aside. Now remove the halloumi cheese from its packaging and cut it into 2cm slices. Coat each slice with a sprinkling of smoked paprika, using your hands to coat them as evenly as possible. 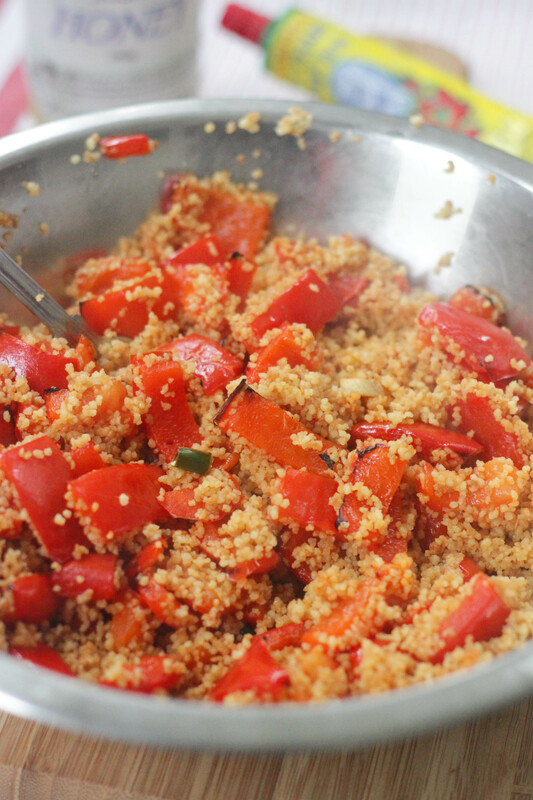 Once the peppers are ready, remove them from the oven and add them to the toasted couscous, mixing well. Add the teaspoon of harissa and the teaspoon of honey and squeeze in the juice of the lemon. Mix well and give it a taste, adding a bit of salt or more lemon if you like. Now heat a drizzle of olive oil in a non-stick frying pan over a medium to high heat. 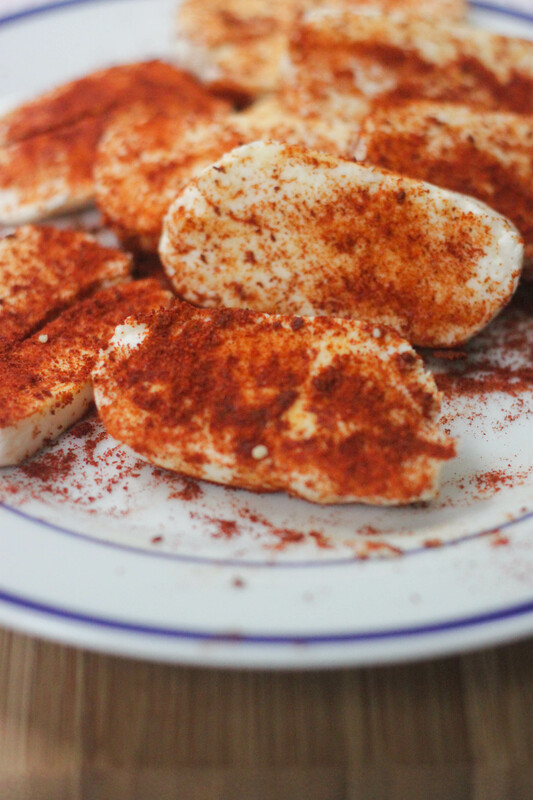 Fry the paprika-covered halloumi slices for about 3 to 4 minutes on each side, until beautifully golden. 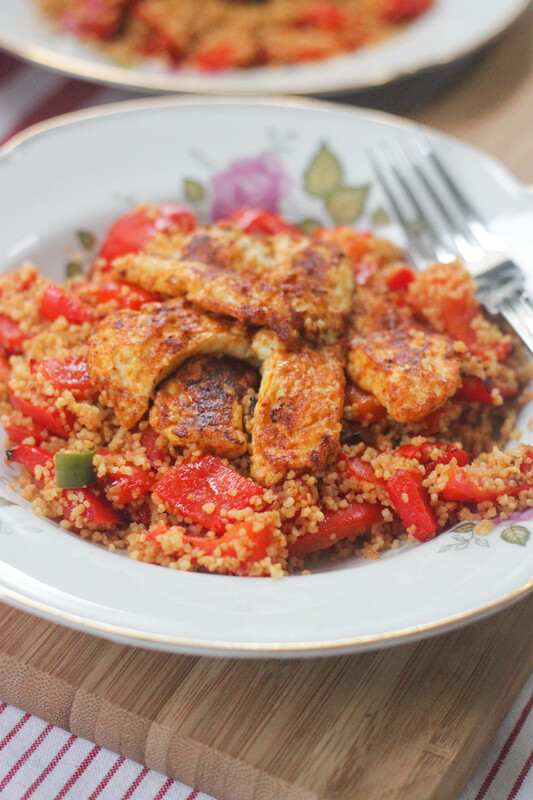 Serve the halloumi slices on top of the couscous, with a dollop of natural yoghurt on top if you like. One more time congratulations! I like halloumi but I’ve never tried it at home. Thanks so much Magda Definitely try halloumi at home, it’s a piece of cake. Just fry it up and serve it with your favourite salad. Yum! This looks AMAZING, I’m definitely going to try it next week. And huge congrats to the two of you, too. Such a sweet story! Thanks a mill Lauren! 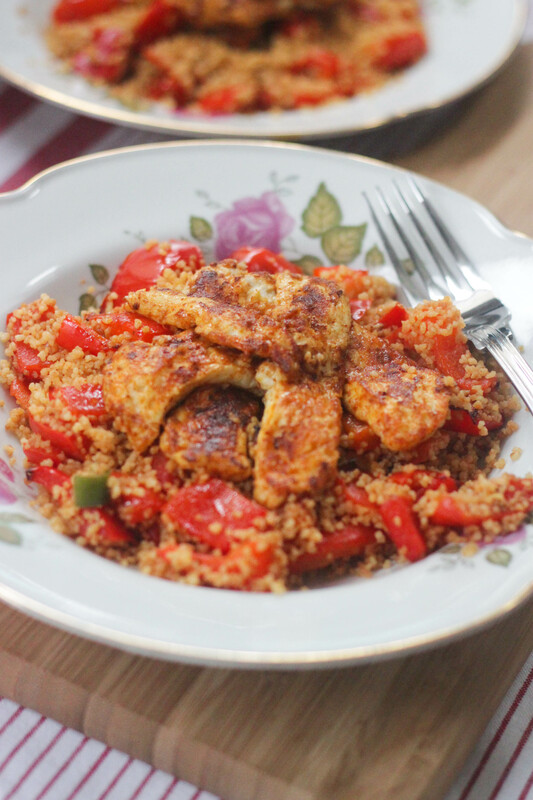 Hope you enjoy the halloumi couscous, a lovely simple supper. He’s still gotta get you a ring though, right? Such a lovely post. Watching your story unfold on twitter and Instagram really made me smile the other day so congratulations to you both again. You have also reminded me that I have been meaning to try halloumi. 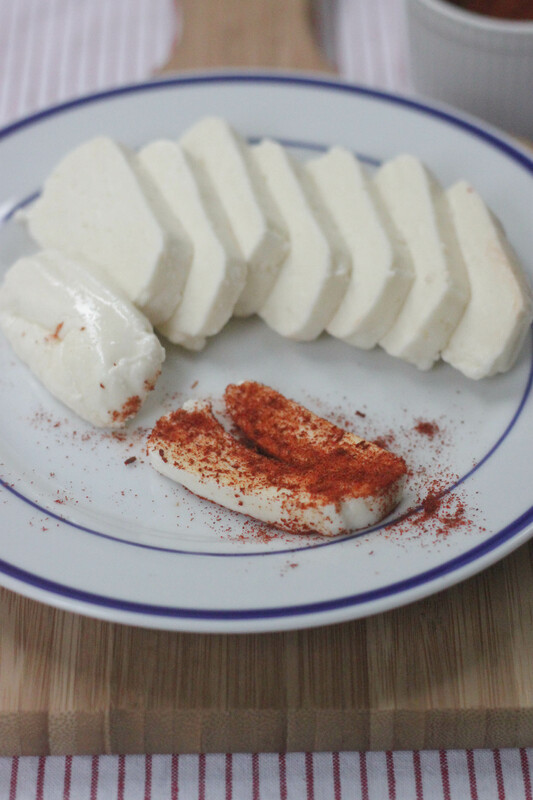 Definitely get yourself some halloumi cheese, it’s awesome! You wee cuties! This sounds yum and not too bold. Congrats! In one fell swoop (aka a few tweets and a few Instagram pictures), you washed away the cynicism of 1,000 people regarding the Leap Day practice of women proposing to men. Congrats Aoife! Been there myself, it’s so nerve racking even though I was 99.9% sure what the answer was going to be! Thanks a million, Stef. It’s amazing how that 0.01% of doubt can really freak you out! Worth it in the end though. Thanks a million Moninne! So glad you’re enjoying the recipes, hope you’ve been able to try a few. Thanks again for saying hello, hope our paths cross again sometime soon, I’m sure they will! Pingback: Rabbit Pie « I Can Has Cook? How cute. Congrats to you both and well done to you for taking the plunge. PS. And BiBi’s looks divine! Thanks so much Imen I was very relieved he said yes! You definitely have to try halloumi, it’s the biz. And BiBi’s is a fab little spot. We’re hoping the date will be sometime between now and the next leap year so get your hat ready! Congratulations again, I was watching your twitter/instagram story play out too and was so excited, I was even showing my colleague the photos. I also love halloumi, yum!